More than a few times in my life, things have had a way of working themselves out. And on occasion they have bound themselves together in ways that make “Six Degrees of Kevin Bacon” seem pessimistic. Such is the case this afternoon while I was working on the William Halsey Wood project. Nineteenth century architect William Halsey Wood plays rather large in my range of interests on several counts. Quite beyond his architectural output, which includes a remarkable number of exceptionally curious and interesting works, there is the matter of his also exceptionally short career: a mere twenty years. Yet that window of professional opportunity yielded well over one hundred and fifty projects, most of them built but only a handful surviving. The list of works contains one of highly dubious status, for it was built in Agincourt, Iowa, and stood for seventy-five years before being struck by lightening. Dubious because, as many of you understand full well, Agincourt is a fictional place but equally so a place of fiction. The Fennimore County courthouse of 1888-1889 was a Halsey Wood design by me working on his behalf. Agincourt’s favorite son architect Anson Tennant had more than one run-in with Wood: Besides the courthouse, dedicated the year of his birth and a fixture of his youth, Anson constructed a dollhouse when he was fifteen as a Christmas gift for his little sister Claire. Again, as some of you may recall, that house was inspired by a Halsey Wood house published in the Scientific American Architects & Builders Supplement, and subsequently resulted in a set of children’s building blocks trademarked “Wm Halsey Wood Blox” in 1912. It was during that summer, 1912, that Anson and his family made a trip east to visit great aunt Hester Tennant Farnham at her summer house in Mantaloking, New Jersey, where for at least two Sundays the family attended services at the Episcopal church of St Simon’s-by-the-Sea. Oddly, that church was also designed by Halsey Wood, though Anson didn’t know it at the time. 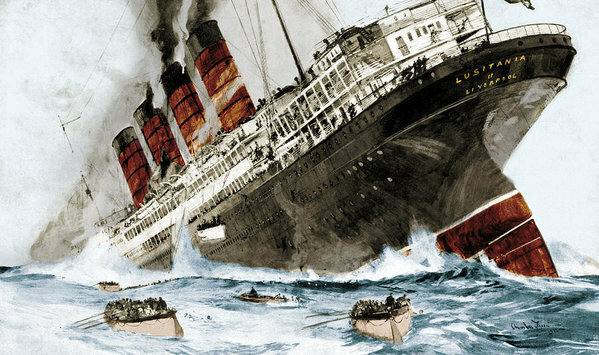 Then in 1915, with his career successfully launched and the public library project nearing completion at home, young Anson Tennant set sail for England aboard the RMS Lusitania. For twenty years or more, he was thought to have gone down with the ship when it was sunk on 7 May, 1915, by a German torpedo. Among the more notable victims of the 1,200 lost that night were Elbert and Alice Hubbard, founders of the Roycroft movement (with whom I hope Anson has several productive conversations), a member of the Vanderbilt family, and many both famous and otherwise. Curiously, and in that spirit of remarkable coincidence, I was searching this afternoon for biographical information on Fr. Basil Maturin, priest and writer and, as fate would have it, an Anglo-Catholic friend of architect William Halsey Wood. Since Wood had died eighteen years previous, he was unable to mourn the death of his friend, so I’ll have to do that on his behalf. Not for the first time, I’m mistaken about the meaning of a familiar phrase: Hobson’s Choice. Turns out that Thomas Hobson was the owner of a livery stable who rented horses. His practice, however, was to offer the horse in the nearest stall and only that horse. Take it or leave it. So the actual meaning of Hobson’s Choice is no choice whatsoever. What I was (and apparently still am) seeking is a shorthand for describing the choice between two bad options — but a choice that must be made. The Lady or the Tiger — and the Lady has bubonic plague. See what I mean? I’m faced with one of those at the moment, which means, as you might guess, that I feel the need to write a very short story about some parallel in Agincourt. Perhaps writing about someone else’s frustration will ease my own. Too many blog entries lately concern the Community Collection’s recent acquisitions. It’s time for a break from the visual arts — no bad place to linger, though, and I’m certain to be back — to explore another aspect of Agincourt’s cultural life: music. By late summer 1895 as the new Auditorium neared completion, management had long since planned a gala opening season through the New Year’s holiday. Musical events of various types (both local talent and traveling troupes); public speakers, elocutionists, and lantern presentations; and of course the formal ceremonies of its dedication to the cultural expanse of community life. Among those events was the local premier of an 18th century French opera, “Philidor” by Didier Argentuille. The forces required, both cast and orchestra, were drawn from local talent, though reaching as far as Omaha for some participants. Who made the choice of an obscure work that, to anyone’s knowledge, had never been performed in the U.S., let alone in Iowa, isn’t recorded. Despite the Plantagenet‘s hyperbole, its review of the premier shouldn’t be taken as the presence of genuine High Culture. How far can I go toward this allusion to an imaginary 18th century opéra comique? Particularly since 1) it’s been fifty years since I took a music appreciation course, and 2) I don’t actually read music. 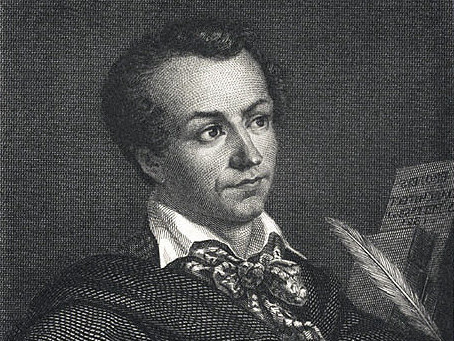 By a remarkable coincidence, François-André Danican Philidor (1726-1795) was, besides being a prominent chess master, a prolific composer of opera and the last generation of a family integral with 18th century music in France. I just ordered a recording of his opera “Sancho Pança dans son isle” — yes, that Sancho Panza. Argentuille would have been of the next generation, but its a start. I’m imagining a hybrid of Steve Martin’s play “Picasso at the Lapine Agile” and Samuel Barber’s chamber opera “A Hand of Bridge”, which crams more psychological introspection into nine minutes than I thought possible. ”Philidor” itself will never exist, and it’s libretto is almost as unlikely, though I might, just might conjure a snippet of dialogue that migh5 constitute a duet between the two principals, Messrs Philidor and Franklin. That, I hope, is where Barber and Martin come into the picture: Barber’s librettist was Gian Carlo Menotti, and a finer writer of “book” for this plot is outside my experience. And Steve Martin’s talent for banter, the give and take between and among artistically best characters is what I need right now for stimulation. Ultimately, of course, there will have been a performance and a review of same in the Plantagenet. Stay tuned. ALLEN, George. The Life of Philidor, Musician and Chess-Player. (Philadelphia: E. H. Butler & Co., 1863). BARBER, Samuel. A Hand of Bridge: For Four Solo Voices and Chamber Orchestra : [Op. 35]. (New York: G. Schirmer, 1960). FRANKLIN, Benjamin, The Autobiography of Benjamin Franklin. MARTIN, Steve. “Picasso at the Lapine Agile”. (NY: Samuel French, 1993). Local artists and restaurants have joined forces to raise funds for the regional food pantry, Feed the Need. Their collaboration will yield an illustrated cookbook, a collection of recipes from favored local chefs with illustrations solicited from a wide range of artists. “Kitchen” was contributed by Guillaume Lebeau, friend of Rosemary Plicka, chef at The Periodic Table. 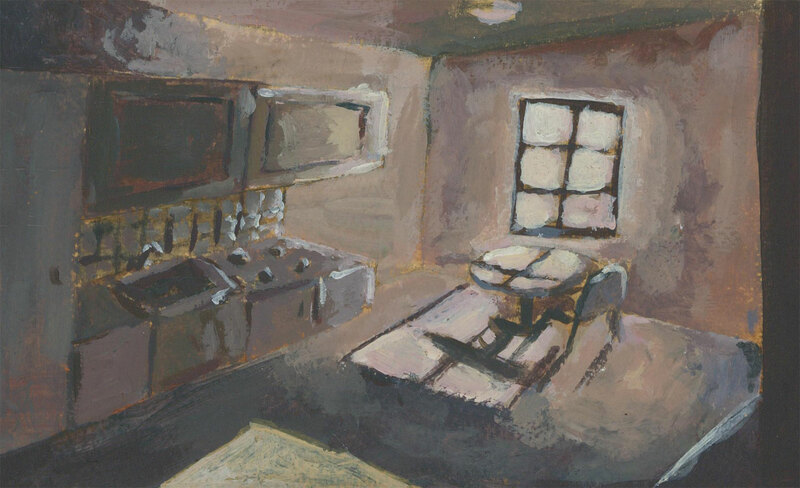 For a book type associated with the joyous topic of food, LeBeau’s “Kitchen” is remarkably sober, a dimly lit and distorted perspective of an empty room — the antithesis of family and friends gathered for that most social of human activities, the enjoyment of a meal and its preparation. This would be more appropriate in the opening credits for an episode of “Twilight Zone”. Like his near contemporary Leonard Baskin, Robert Marx has worked in multiple media and excelled in each. 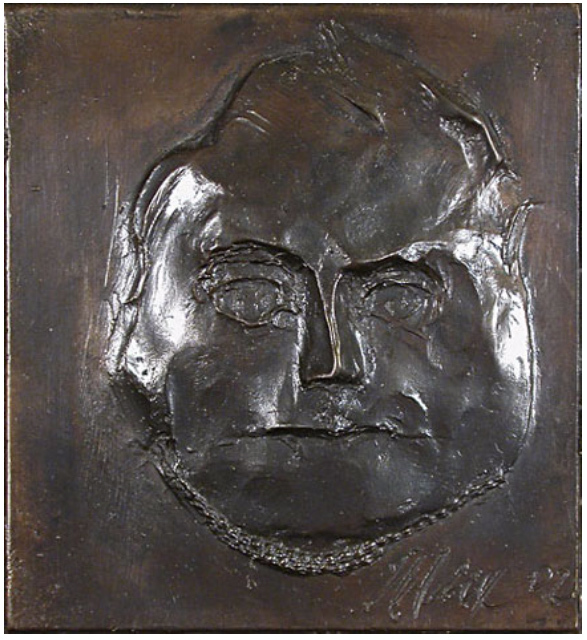 This small cast bronze piece is a “character study” in shallow relief comparable to his etchings in their psychological insights. If you lived in Chicago in the late 1950s and early ’60s, the chances are very good that you’ll recall WFMT radio, the classical station at 98.7 on your FM dial. I grew up musically on the broadcasts of Marty Robinson and especially Norm Pellegrini (1929-2009) each of whom elevated my musical taste far above where it ought to have been for a fifteen-year-old. Saturday afternoons were particularly weird, because I worked at my dad’s gas station and listened to WFMT between pumping gas, wiping windows, checking oil and ATF fluid, and, when I was old enough, actually greasing cars. Yes, I know how to give a lube job. I recall one particular Saturday when Norm programmed William Schuman’s Symphony #3, a 1941 work commissioned by the BSO and premiered by Serge Koussevitsky himself. It may very well have been that recording I heard. Bill Schuman, by the way, is not the German “Romantic” composer you may be thinking of; that would be Robert Schumann, with two N’s; wife Clara. No, Bill Schuman (I’m given to understand he preferred to be called “Bill”) was an American composer of the 20th century who grew to be among my most favored. Somehow I came to associate the 1941-ishness of his third symphonic work with my own 1945-ishness. In other words, I gradually identified with a work that was my near contemporary. That particular Saturday afternoon—in about 1961, I suspect—I probably played the radio a bit too loud in the station for any other sort of actual conversation to take place: the end is particularly raucous. Schuman is on my mind this afternoon for two related reasons: #1) there is a recent recording of a work that had never been released previously (“The Witch of Endor”) and #2) I almost wrote him to commission a work. “Tradition” is an odd concept, because there has to have been a time when tradition was new; “B.T.” = Before Tradition. What, I wondered aloud to my classmates, was played at high school graduations before Sir Edward Elgar wrote ‘Pomp & Circumstance” in 1901 (actually a group of six marches identified as Opus 39; it’s the No. 1 that we hear most often). What had been “traditional” before then? When did the Elgar piece itself attain the status of “tradition”? Arguments that fell flat before a hostile crowd. They would hear nothing of such heresy. We would march into our high school gymnasium to the tune of Sir Edward and that was all there was to it. Which we did, indeed, do. What, you ask, was the graduation gift that we eventually settled on? A score board for the swimming pool, which must have shorted out after a couple years’ service and been consigned to the scrap heap of electronic progress. That desire to commission a work of music had to wait. Forty-four years, in fact, until I mustered the courage to approach another American composer, Daron Hagen, and propose a sesqui-centennial march for the fictional town of Agincourt, Iowa. I don’t think that Bill Schuman would have turned us down and I had faith that Daron Hagen would be equally intrigued by such an exotic proposition. 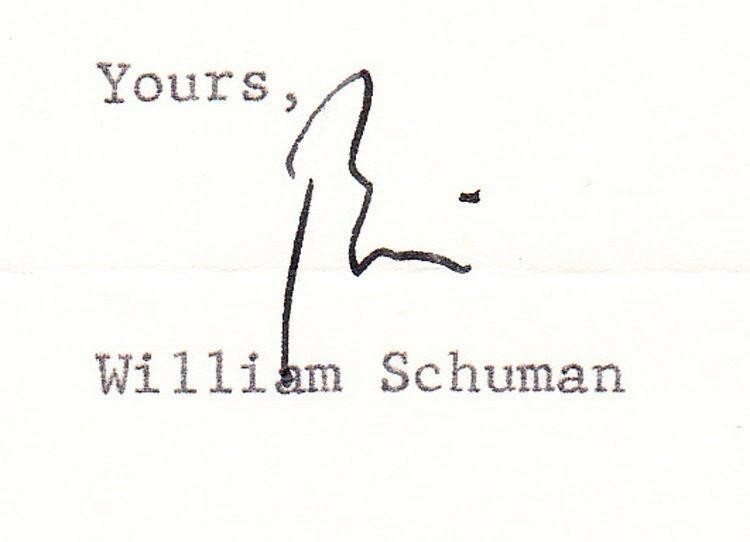 William Schuman died in 1992, so we’ll never know. But I’ll bet it would have been a show stopper and put our high school on the map for at least a week or two.